Have you heard the news about the new baggage rules of Saudia Airlines ? Well I just like to inform our readers regarding the baggage allowance to be implemented by Saudia Airlines. The news was posted in Arab News 2 days ago (here). According to the report, the new rules will be implemented on September 1, 2012.Â The new scheme is based on the â€œpiece conceptâ€ as opposed to the â€œweight conceptâ€.Â Saudi says that the piece concept is automatically reflected on the tickets of the passengers. Each bag shall have the following dimension : length 90cm, breadth 75cm and height 43cm. Currently travellers are allowed to carry, 40 kg irrespective of the number of pieces. This will no longer be allowed on September 1, 2012. Only 1 piece is allowed with a maximum weight of 32 kgs. Each economy class passenger will be allowed to carry only one piece of 32 kg or less. For the first and business class, the airline will allow two pieces of 32 kg each. Each passenger who have two pieces of 16 kg box, will have to pay for the other baggage. The second will be calculated as an extra baggage. 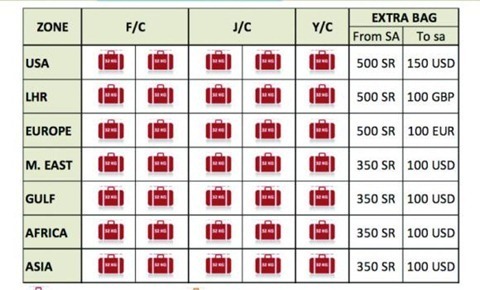 Extra baggage charge is shown on the picture above. Holders of Fursan Gold and Silver Cards will be given an additional baggage allowance free of charge. Guest Class passengers who would like to take an extra bag, will be allowed an additional bag weighing 23 kg with an extra payment of SR 350 for African and Asian destinations and SR 500 to destinations in the United States , while Business Class passengers will be allowed the similar facility with 32kg for the additional bag. Carry-on baggage must not exceed 9 kg in First and Business class and 7kg in Economy class cabins. The baggage size should not exceed that of overhead compartment capacity. It is forbidden to carry compressed and liquid materials in either checked-in baggage or carry-on baggage. How to Pay Mobily E-Life Through Sadad? $1BN E-commerce Site Will Be Launching This Year? how true is this, how come there is a dead link whenever i click d “arab news” part? is this refelected on Saudi Airline’s website? pls make this clear for most of us uses Saudia Air traveling to our country.thank you! This is so not good! No wonder people will stop using Saudi Airlines now!